on thursday 22 may 2008 we posted a video and our comments on an incident we observed in the 20 may 2008 city of alexandria, la. city council meeting. around sixty-one minutes after our post we received a rather snide comment from a mayoral assistant (executive branch) he takes the typical bureaucratic approach by bringing up silly rules, regulations, "protocol," etc and in which he makes excuses for the legislative branch and seems to suggest that since one of the subjects of our post - an alexandria citizen, mr. houston rax, had "addressed the council during the previous three meetings," that somehow that should disqualify him from addressing the council in this instance. looks like a citizen can wear his or her welcome out in a building that they paid and are paying for. 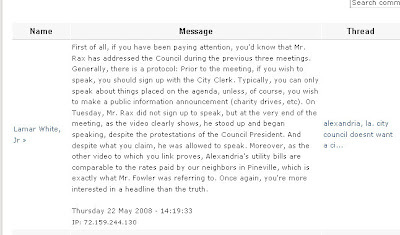 now what would it have hurt, that when mr. rax mentioned utility bills for councilman fowler to have simply said something like "yes sir mr. rax we are still working hard on solving the problem and thank you for keeping the pressure on us." instead of councilman fowler's trying to make the citizen look foolish with his "compared to what?" statement? anyway, the mayoral assistant chided us for not paying attention, so we decided that we better pay attention and imagine our surprise, when, upon further investigation we learned that the city is dedicating considerable time and tax-payer resources to almost hourly monitor our blog, which doesnt make any sense since the city doesnt take us seriously anyway. 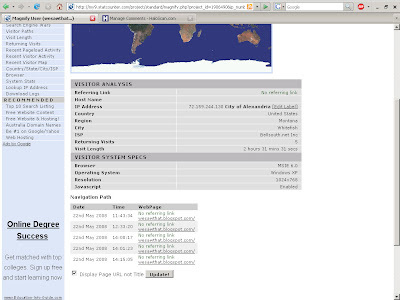 we're sure that the mayoral assistants promoting his own blog on city time was an oversight. 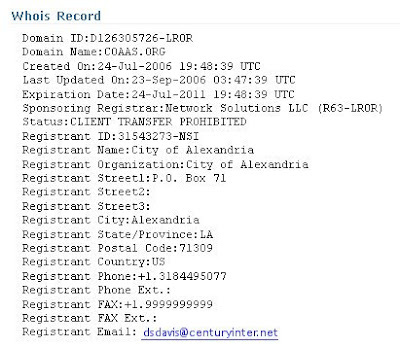 which ultimately resolves to coaas.org which is a domain registered to the city of alexandria, la. alexandria, la. city council doesnt want a citizen to address it! nutty katrina mary landrieu snellings using her govt. internet access account to monitor blogs?